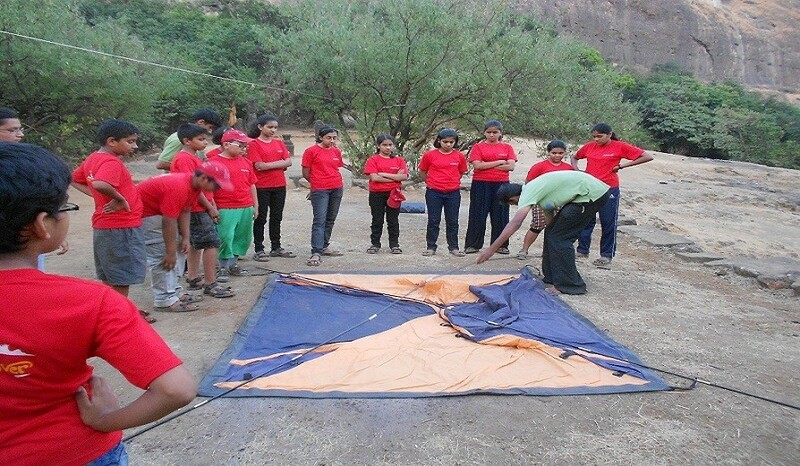 Rajmachi Camping site is around 16 kms from Lonavala City. Still it’s a beautiful spot away from the crowd. 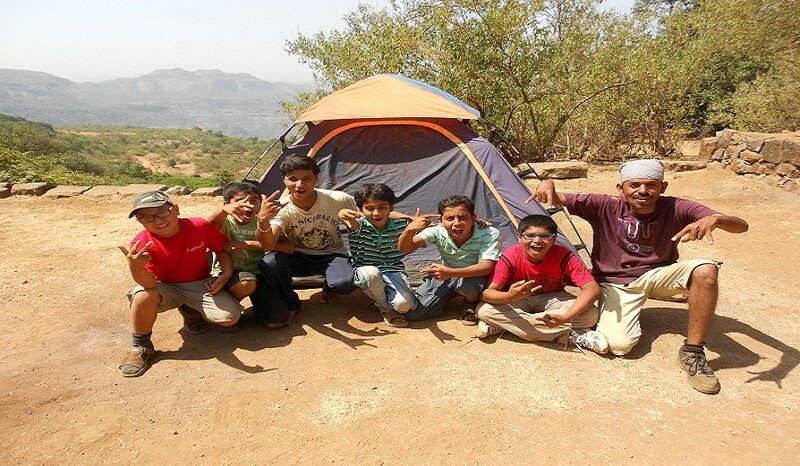 Campsite is located facing mountains in front with trees around and Rajmachi fort in backdrop. Rajmachi (Udhewadi) is a small village in the rugged mountains of Sahyadri in Lonavala, India. The fortification at Rajmachi consists of two forts, namely Srivardhan Fort and Manoranjan Fort. If you think of camping is not comfortable for your kids then you think wrong. All Participants have to report at Shivajinagar Railway Station by sharp 6.00 am. Attendance, information to parents. Board Pune – Lonavala Local by sharp 6.30 am. Reach Lonavala around 8 am & immediately move towards Rajmachi Jungle by Local Sumo. Breakfast at lonavala. Reach Rajmachi around 10.30 am. Tent allotments, Lunch. Tent Pitching, Tent allotments, Lunch. After Lunch Introduction, Study of a Campsite & Rural life, Ice Breaking, Rope Activities. The Day starts with some warm-up session. 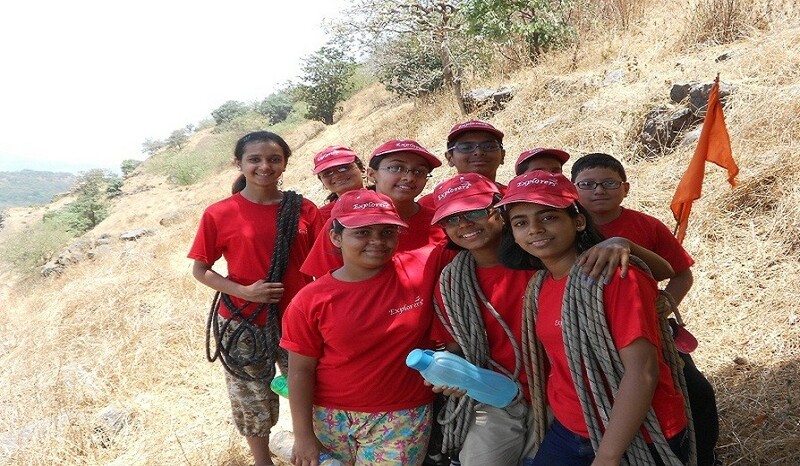 After Breakfast a small trek to “Manoranjan Fort” with Basics of Rock Climbing. Post Lunch visit to ancient Temple & Small lake. Evening How to make “Chulha” in Jungle to cook the food, Night Trail & Star Gazing with Experts of Team Explorers. Morning starts with some Fun Activities. After Breakfast a small trek to “Srivardhan fort” focusing on Fort Architecture, Geographical Information followed by Rappelling Session by Experts of Team Explorers. Post Lunch Team Activities, Kayaking. Evening Cultural Night, Campfire, Music-Masti. After Breakfast River Crossing, Group Games, Distribution of Achievement Certificate & Medal to each participant. Post Lunch depart for Lonavala by 02.00 pm. Reach Lonavala around 3.30 pm. After Evening Snacks Mumbai Participants will board 11008 Deccan Express by 04.28 pm & Pune participants will Board Lonavala – Pune Local by 05.25 pm. Reach Pune till 07.00 pm. Tooth Brush, Tooth Paste, Soap, Shampoo, Towel, Napkin, Scarf, Tissue Paper. Inners (For 4 Days), Shoes, Extra Socks, Floaters for Journey / Water Sports. Bring all this stuff in Haversack / Travel Bag. also Bring Mini Sack to carry Water bottle at the time of Trekking. Stay on multiple sharing basis in Non AC Dome shape Tents. Pune / Mumbai – Lonavala – Pune / Mumbai by Non AC Train & Non AC sumo from Lonavala – Rajmachi – Lonavala. Toilet Tents Facility separate for Boys & Girls. All Camp Activities mentioned in Camp Highlights. All food charges for the entire period of camp. (Tea, Breakfast, Lunch & Dinner). Rajmachi Entry fees, Pollution Tax, etc. Expert, Experienced & Certified Team – Pune to Pune. Mineral water for entire camp period. All Tested & Safety gears for adventure Activities. First aid Facility throughout the camp. Avoid unnecessary Luggage. Try to keep the Cloths Day wise at the time of Packing. Carry a dull coloured dupatta /scarf to cover your ears and nose during the travel. Keep the Necessary Medicines with Child, if required & inform the same to Explorers office. Keep our Nature clean. Please carry all non-biodegradable (plastic) waste back with you. Always keep Original Photo ID with the Child. Don’t expect similar food quality of your home town. Try Local food to have some special Experience.